An Excel worksheet wouldn’t be worth very much without any data. You can’t start analyzing, poking, and prodding data on your iPad until you enter the numbers. These pages explain how to enter, select, and edit data. They also show how to delete, copy, and move data on a worksheet. 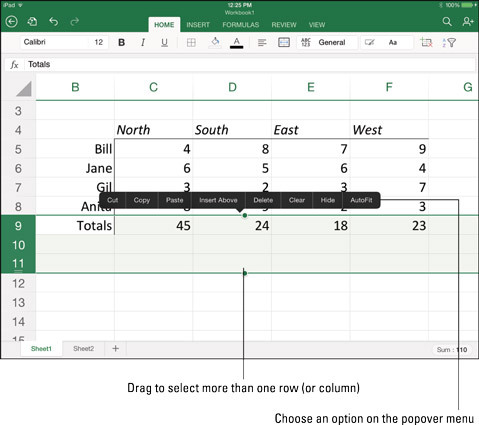 All data in worksheets is entered in cells, the places on the worksheet where columns and rows intersect. Each cell can hold text, a data value, a logical value (True or False), a formula, or nothing at all. Double‐tap the cell where you want to enter data. Excel activates the Formula bar. Meanwhile, the keyboard appears, as do the Letters button and the Numbers button so that you can switch between a lettered keyboard and a numbered keyboard. To enter numbers, tap the Numbers button to display the numbered keyboard. To enter text — for example, to enter a descriptive data label — tap the Letters button, if necessary. 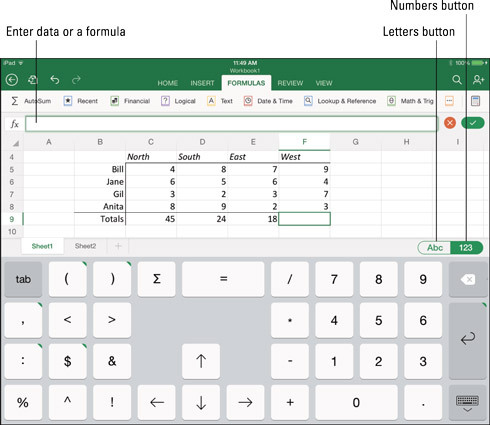 Tap the Return key to enter your data in the cell. Tapping Return enters the data, selects the cell below, and makes that cell the active cell so that you can enter data there. As well as tapping the Return key to enter data, you can tap an arrow key. Tapping an arrow key makes the cell above, the cell below, the cell to the left, or the cell to the right the active cell. Tap the Keyboard key to close the keyboard. This key is located in the lower‐right corner of the keyboard. Double‐tap a cell to enter data in it. Excel offers the Fill command for entering serial data such as number sequences and the days of the week. To enter serial data, start by selecting the first two items in the series. For example, to enter the days of the week, enter Monday in one cell and Tuesday in the next, and select both cells. With the cells selected, tap Fill on the popover menu. Then drag a green arrow on the selected cell range to fill out the rest of the serial data. Selecting one cell: Double‐tap a cell to select it. Selecting a range of cells: Tap the first cell to make its selection handles appear. Then drag a selection handle to encompass all the cells you want to select. Selecting a range of cells. Editing: Double‐tap to select the cell with data that needs editing. Then tap in the Formula bar where the data needs editing and edit to your heart’s content. Deleting: Select the cells with the data you want to delete. Then, on the popover menu, select Clear. 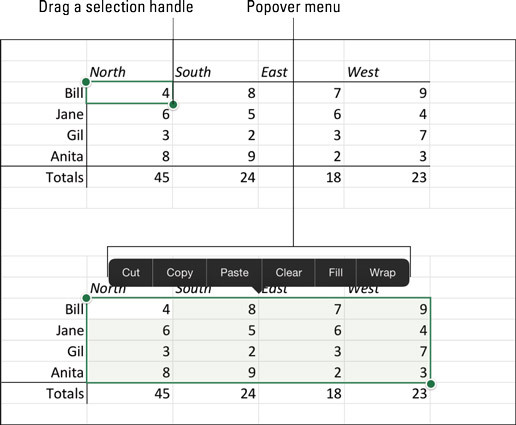 Moving and copying: Select the cells with the data and choose Cut or Copy on the popover menu. Marquee lights appear around the data to show that it can be moved or copied. Select the cells where you want to move or copy the data and choose Paste on the popover menu. After you paste data, you see the Paste Options button. Click this button and choose an option from the drop‐down list to keep the cells’ formatting, paste values only, or paste formulas. To select a column or row, tap its column number or heading letter. At this point, you can select more than one column or row by dragging a green selection handle. Insert column(s). Select the column to the right of where you want to insert columns. For example, to insert a column between what are now columns E and F, select column F. You can insert more than one column by selecting more than one. Excel inserts as many columns as the number you select before the Insert operation. Insert row(s). Select the row below where you want to insert rows. For example, to insert a row above what is now row 8, select row 8. You can insert more than one row by selecting more than one. Excel inserts as many rows as the number you select before the Insert operation. Delete columns or rows. Select the row(s) or column(s) you want to delete. Choose an option on the popover menu. Insert columns. Choose Insert Left on the popover menu. Insert rows. Choose Insert Above on the popover menu. Delete columns or rows. Choose Delete on the popover menu. You can also insert and delete rows and columns with the Insert & Delete Cells button on the Home tab. Select row(s) and column(s), click the Insert & Delete Cells button, and choose an Insert or Delete option on the drop‐down menu. Choose Insert or Delete on the popover menu to insert or delete columns or rows.